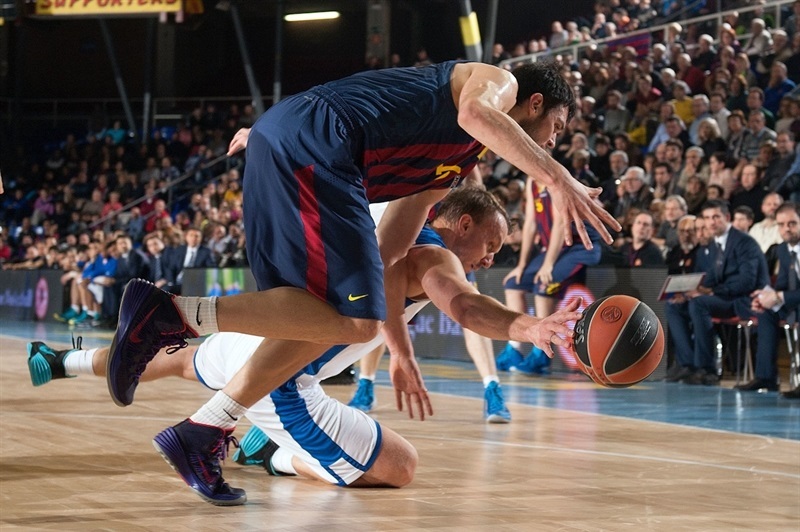 FC Barcelona opened the 2013-14 Turkish Airlines Euroleague Top 16 in style by downing Anadolu Efes Istanbul 84-65 in Group E at Palau Blaugrana on Thursday. 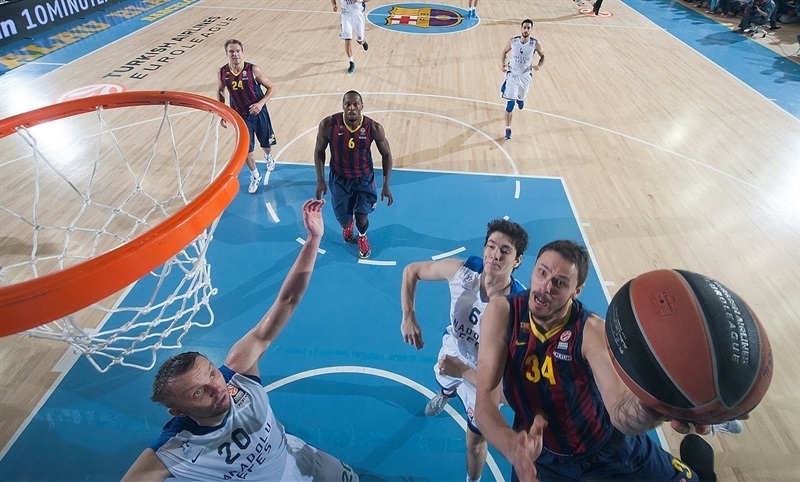 Barcelona recorded its eighth home win against Efes in as many games. 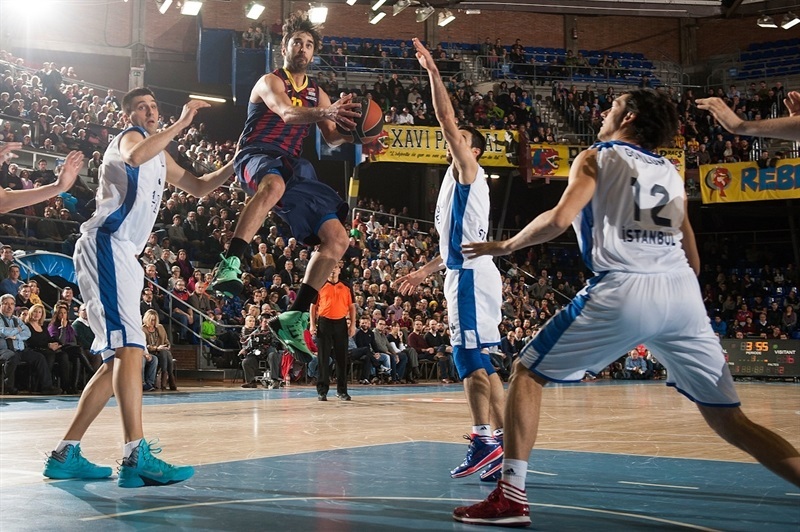 Juan Carlos Navarro paced the winners with 21 points. 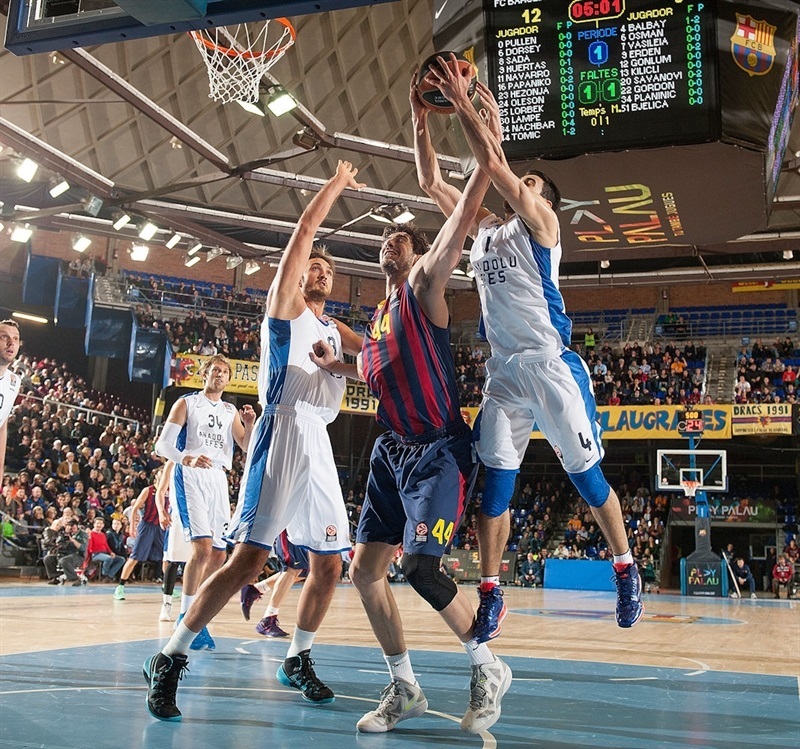 Brad Oleson added 13, Kostas Papanikolaou scored 12 while Joey Dorsey tallied 10 points and 11 rebounds for Barcelona. 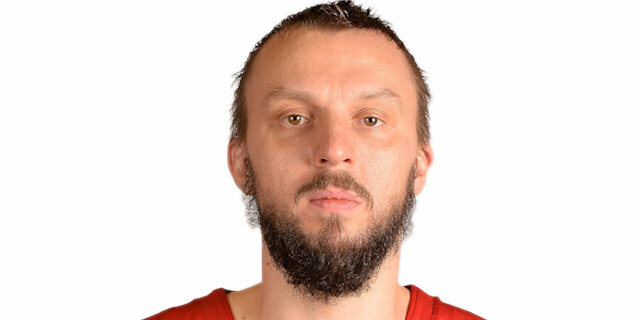 Semih Erden led Efes with 15 points. Dusko Savanovic added 12 while Kerem Gonlum had 10 for the guests. 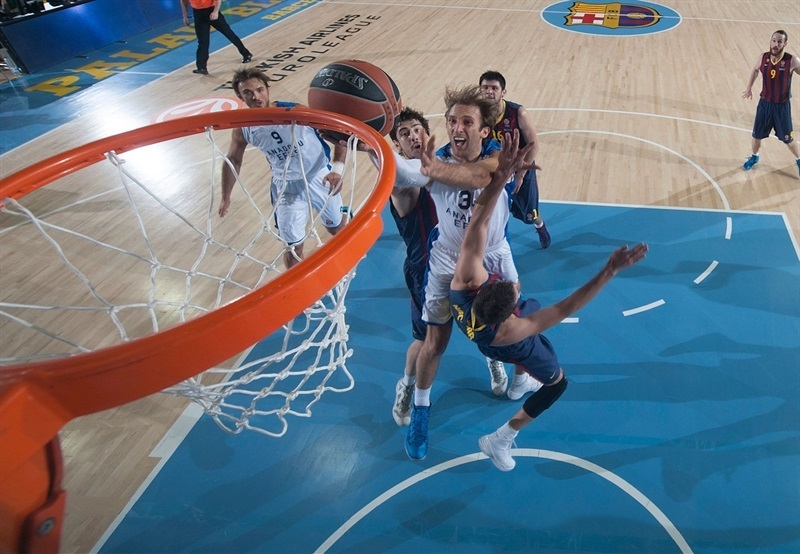 A 12-2 run that Bostjan Nachbar capped with a dunk gave Barcelona an early 12-4 lead. Gonlum kept Efes within 23-16 late in the first quarter but Erazem Lorbek, Navarro and Oleson fueled a 25-2 run that broke the game open, 48-18. Efes got within 53-29 at halftime, but Nothing changed after the break, as Barcelona kept a safe double-digit margin all the way until the final buzzer. Savanovic got Efes going with a layup which Navarro bettered with a three-pointer that gave Barcelona its first lead, 3-2. A chase-down block by Kostas Papanikolaou ignited the crowd and a turnaround jumper by Boki Nachbar boosted the hosts' lead to 5-2. 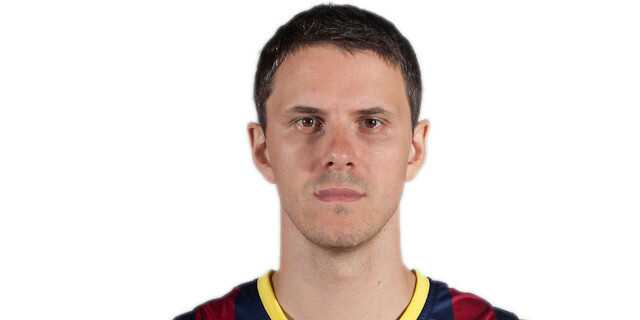 Semih Erden and Ante Tomic traded baskets and a free throw by Marcelinho Huertas gave his team an 8-4 edge. 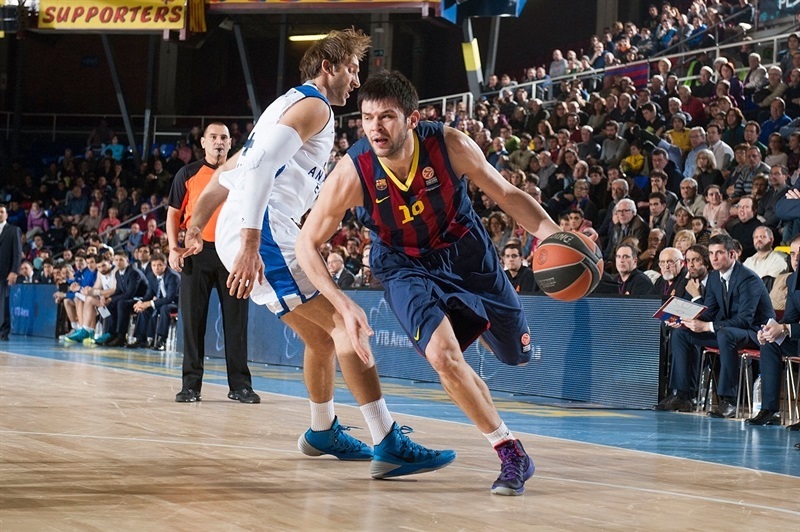 Papanikolaou kept pacing Barcelona with a layup and a dunk by Nachbar caused Efes to stop the game at 12-4. Dogus Balbay scored off a steal, but Huertas scored in transition and a driving layup by Navarro made it a double-digit game, 16-6. Gonlum tried to change things with a slam that Papanikolaou improved on with a three-pointer. Gonlum dunked again and added a layup in transition to give Efes hope at 19-12. After Oleson hit foul shots, Zoran Planinic and Erazem Lorbek traded jumpers before another basket by Gonlum kept Efes within 23-16. A driving layup by Oleson fixed the score at 25-16 after 10 minutes. Oleson struck from downtown early in the second quarter, as Efes tried to get Savanovic involved. Dorsey provided a highlight with a huge put-back slam, good for a 30-16 Barcelona lead. Lorbek banked in a mid-range jumper and a layup by Victor Sada capped an 11-0 run. Erden and Dorsey traded close baskets and Nachbar sank his trademark five-jumper jumper to make it a 20-point game. Efes called timeout, but Papanikolaou followed with a driving layup and a three-pointer by Navarro broke the game open, 43-18. Sada ignited the crowd with a fast break slam and Navarro nailed another corner triple that boosted Barcelona's lead to 30 after a mammoth 25-2 run. Vasileiadis swished a mid-range jumper and added a corner triple to bring Efes a bit closer, 48-23 After. Navarro hit free throws, Cedi Osman struck from downtown and Erden brought Efes within 50-27. 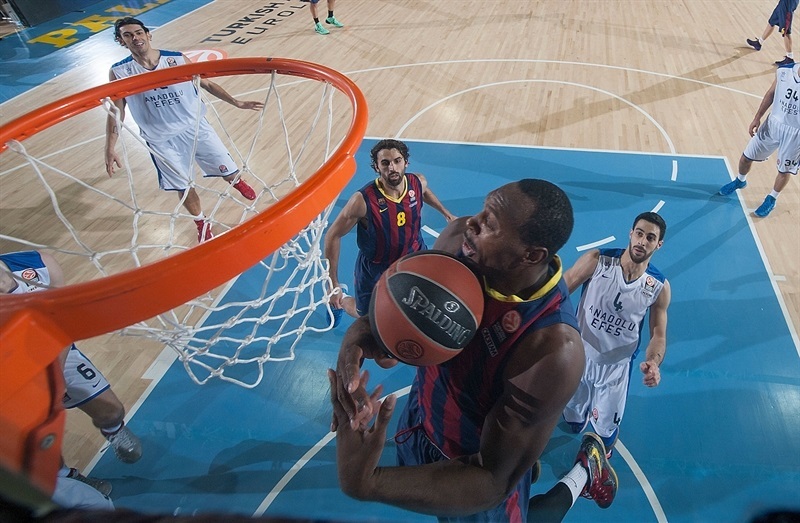 Osman scored again, but a buzzer-beating jumper by Oleson gave Barcelona a 53-29 margin at halftime. Balbay scored in penetration right after the break, as Barcelona was held scoreless for more than four minutes due to Efes's improved man-to-man defense. The guests could not find the way to the basket, however, picking up three consecutive turnovers. 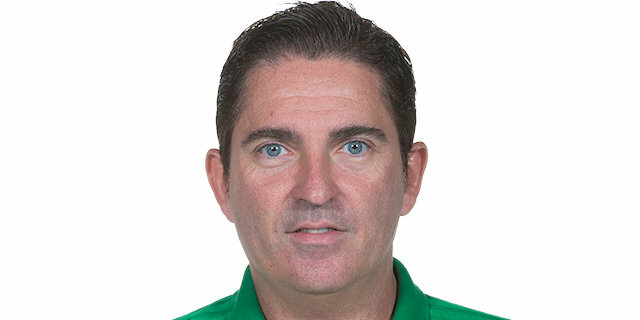 Savanovic struck from downtown to get Efes a bit closer, 52-34, causing head coach Xavi Pascual to call timeout. 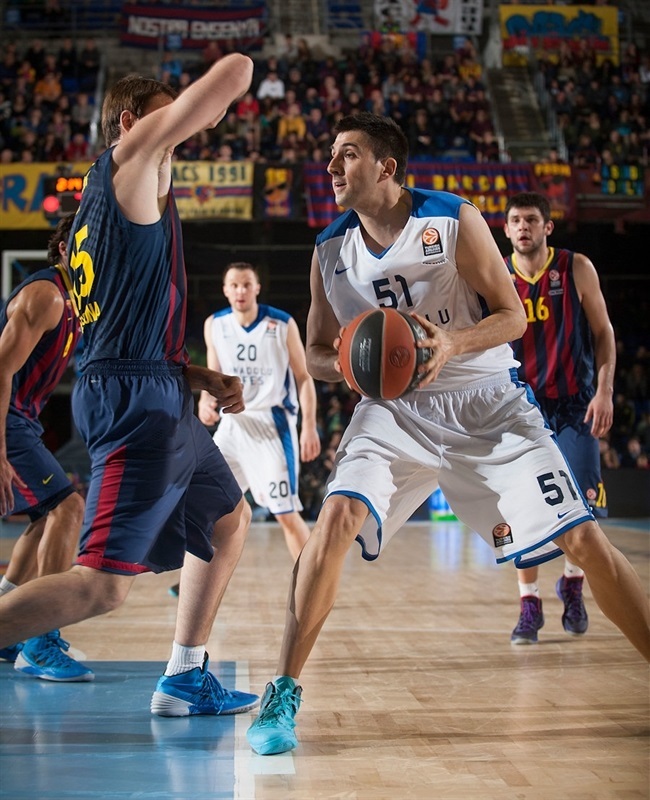 Erden scored down low, but Navarro rescued Barcelona with a three-pointer, good for 55-36. Gonlum and Dorsey traded baskets before a wild off-balance shot by Navarro restored a 59-38 Barcelona lead. Vasileiadis buried a corner triple. 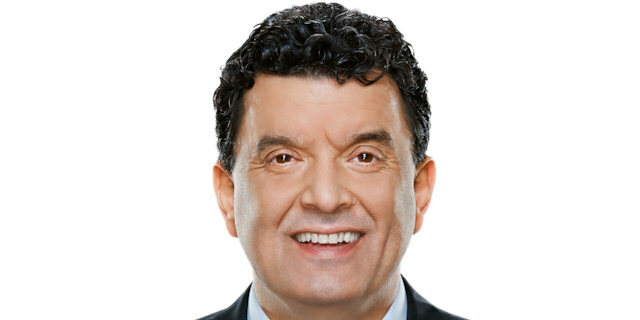 Papanikolaou shined with a driving basket and a free throw by Sada gave the hosts a 62-41 edge. Milko Bjelica and Lorbek exchanged jumpers, but the hosts kept dominating the boards, outrebounding Efes by 15 late in the third quarter. Savanovic nailed another three-pointer and Planinic copied him right after that to get Efes within 65-49 late in the third quarter. Savanovic buried a catch-and-shoot, four-meter jumper early in the fourth quarter. Efes tried a triple-post lineup with Savanovic, Bjelica and Gonlum together on court. Oleson hit a jumper and Dorsey followed that with a layup that kept Barcelona way ahead, 69-51. Efes kept struggling to score while a power layup by Oleson and a free throw by Nachbar boosted the hosts' lead to 73-52. Erden made 3 of 4 free throws before a big, two-handed dunk by Dorsey gave Barcelona a 74-55 lead. 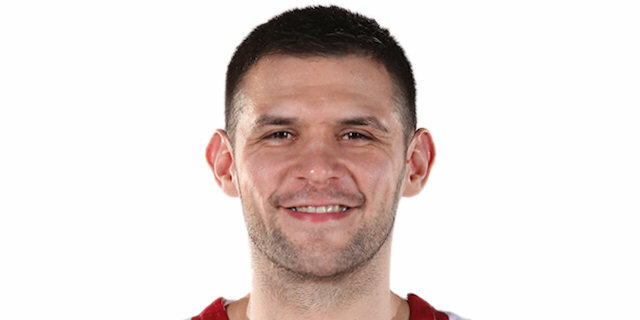 Papanikolaou took over with a huge fast break dunk. Erden hit a baseline jumper and Tomic sent a no-look assist to Sada for an easy layup. 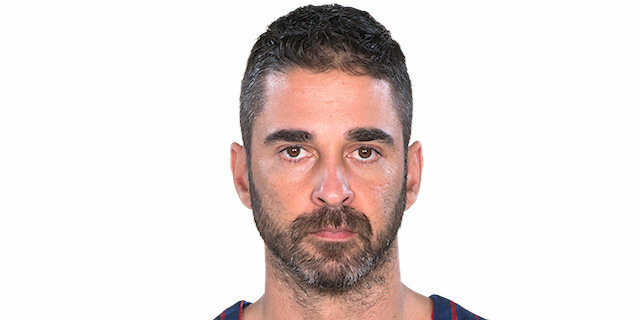 Planinic buried a turnaround jumper, but by the time Navarro nailed a step-back triple from way downtown, everything was said and done and Barcelona had registered its first win in Group E.
"I am happy with this win. It is always important to start the Top 16 with a win. We managed to decide the game in the first half. We played really well, rebounded well and ran the break. We played really well throughout the entire first half other than turnovers, which was the only negative thing before halftime. From that moment, we managed to keep leads around 20 points. It was tough for us in the third quarter, but we managed to get this important win. We played great defense in the first half, with good rhythm and character. 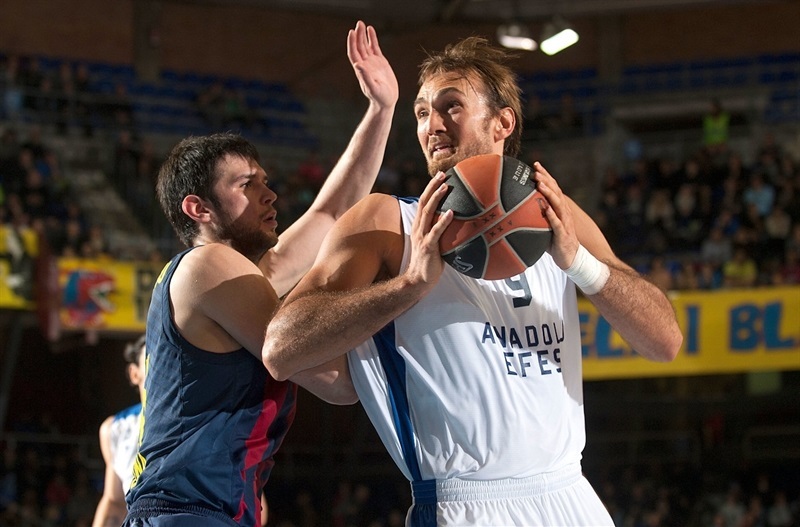 Efes will grow as a team - it is second in the Turkish League. Hopson and Gordon are really important for this and Milko Bjelica will give them more balance. They are a deep team and will be a complicated opponent once they bring all their injured players back." "First of all, congratulations to Barcelona, they played better than us tonight and beat us clearly. It was a tough week for us - we were under pressure because of so many new things - a new coach and a new player. We had injuries and some of them had problems and could not play. Gordon had back spasms the day before the game and Batuk had fever today. Hopson has personal problems and is in the United States. 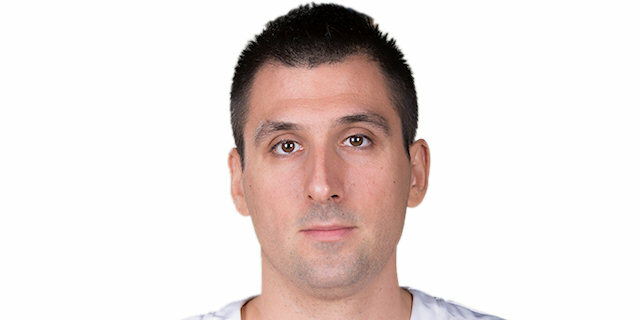 At the same time, we put Vasileiadis in the game after being injured for three weeks and just two practices with the team. One of our goals tonight was to protect our basket, but we had problems with defensive rebounds. We didn't manage to rebound well. I want to wish Barcelona good luck. We have to continue, starting with our next game in the Turkish League this weekend." "We played really well, especially in the first half, in which we played really fast, with good defense. Things slowed down after that, especially in the third quarter. That has happened to us in many games before this. We allowed our opponent to rally a bit, but I am happy. We start from scratch again and winning at home by a big margin is good for us - a quiet game. The best part of the season just started and we hope that we can stay injury-free. Brad Oleson is a reliable player, I am feeling better and Alex Abrines's injury doesn't seem to be very serious. We will try to keep everyone in the best physical condition." "Nothing is easy. You have to fight for it; you have to play hard for it. We went into the game and played hard. They had two or three players missing. They were without Gordon, who for me is their best player. With Hopson, that’s two key players that were missing. It was a great win. We have to be happy about that, but it’s only a win; nothing more. " "It’s a good start to the Top 16. I think our energy in the first quarter decided the game. We jumped on them early and were able to keep the 20-point lead – more or less – throughout the whole game. It’s important to win home games and this was the first step. Even though I think we showed focus early on, it was maybe not the best second half for us, but it was enough to win. " " It is the beginning of the Top 16. Every game is important, but it is not a shame we lost like this. We missed three crucial, very important players. You could see we played the game with only eight players. It was a little struggle covering all the positions, trying to find a rhythm. But in the end, being in the game, down 16, 17, 18 points, against Barcelona, I think it is a pretty good job. If we played in the beginning like we played in the last 20 minutes, it would be an even better game, an interesting game. But Barca crushed us in the beginning. Barca played really fast, especially in open court with Navarro, Lorbek, everybody can spread the court. In the end, we found the rhythm, but it was late." " There a lot of changes in the team. We were missing couple of players, we have a new player on the team and a new coach. It is always difficult, especially playing against Barcelona on its home court. Barcelona played very well, punished our weak sides, and deserved this win. We are looking forward to using any chance to improve our game. "